BaroqueAgain1 wrote: We've come a long way from 2014's epic Big Cap, when a truly game Game On Dude defeated 2013 3yo champ Will Take Charge and BC Classic winner Mucho Macho Man. And Imperative. I actually like Imperative. He's like a piece of furniture. I've never seen Hess Jr. as one to, well....create a plan. I wonder if he's decided to do what Baltas often did with the horse and run in the SAH and then the CT Classic. And while I'm at it, what kind of meds would one have been put on if they predicted 10 years ago that a spring race for older horses at Charles Town would be worth twice what the Santa Anita Handicap is worth? To have come up with that a person would probably have to be on something they bought on the street manufactured by Heisenberg. I predict they work him until he fires a bullet (5 2/3 f, perhaps. . ), then he will be retired. I can't believe they haven't gelded Cozmic One. Arrogate worked like the superstar he has become on Monday at Santa Anita, and will make his next start March 25 in the Grade 1, $10 million Dubai World Cup. Midnight Storm also worked like a star Monday at Santa Anita. The presumptive favorite for the Grade 1, $750,000 Santa Anita Handicap on March 11, he may also run in Dubai, which would preclude a start in the Big Cap. That's ambitious. 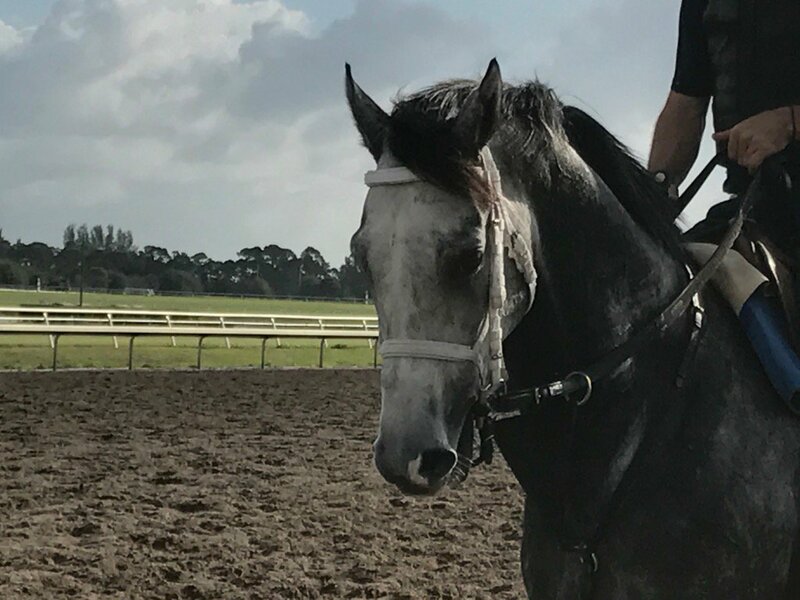 Maybe Midnight Storm's connections are thinking that a 2nd place in a $10 million race is still worth a lot more than winning the Big Cap? If Arrogate, Hoppertunity and Midnight Storm all head off to Dubai, that's probably going to mean a thin field for one of Santa Anita's premier races for older horses. Perhaps someone should ship in from the East Coast to take advantage? They keep changing their minds about Midnight Storm which I admit makes me frown a little. Without Arrogate, the $750,000 Santa Anita Handicap on March 11 lacks a heavy favorite. Shaman Ghost, second in the Pegasus World Cup, is a possible runner, trainer Jimmy Jerkens said. Shaman Ghost would be a great entrant, with a good chance to win. I'm not so sure about Isotherm; the Lonhro colt seems to have a distinct preference for the grass. Good! I'd like to see him get his first G1 win on dirt this year. Not once, but twice now, Richard Pell's Calculator is back for more. For the second year in a row the 5-year-old son of In Summation has given his connections reason for hope after a long layoff. The gray's issues have been well documented. In 2014 it was a foot injury that forced his scratch out of the Breeders' Cup Juvenile (G1), in 2015 an ankle fracture derailed a potential Triple Crown run, and in 2016 nagging foot issues again put him on the bench during a year in which he was a head away from being a grade 1 winner in the Carter Handicap (G1) at Aqueduct Racetrack. But he started 2016 with a game optional-claiming allowance win and did the same March 2 at Santa Anita Park, albeit on a different surface. Bird Song just took the G3 Fred Hooper at Gulfstream, pretty much on the front all the way. The Mary Lou Whitney-owned son of Unbridled's Song continues what seems to be a standout year for the late UBS. Arrogate, Battalion Runner, Bird Song...and I know I'm forgetting some horses. He also is the broodmare sire of stakes winners Tourist and Unique Bella. They're putting quite an exclamation mark on the career of a great stallion. BaroqueAgain1 wrote: Bird Song just took the G3 Fred Hooper at Gulfstream, pretty much on the front all the way. Masochistic returns to the races in the Triple Bend. I also noticed that Kobe's Back, who has been off for a while, is one of the probables for this race. Last edited by BaroqueAgain1 on Wed Mar 08, 2017 3:47 pm, edited 1 time in total. Stanford won the 1 1/16-mile Challenger Stakes at Tampa for fun, and I think I heard the track announcer say that he set a race and track record. Wonder if Pletcher and Co. are now wishing they'd sent him out to SoCal for the Big Cap. Looking forward to his next race. Midnight Storm, who couldn’t quite hold off Shaman Ghost going 1 1/4 miles when finishing second last Saturday in the Santa Anita Handicap, will look toward the Met Mile on Belmont Stakes Day at Belmont Park as the next opportunity to get a Grade 1 victory on dirt, trainer Phil D’Amato said Thursday. stark wrote: Midnight Storm, who couldn’t quite hold off Shaman Ghost going 1 1/4 miles when finishing second last Saturday in the Santa Anita Handicap, will look toward the Met Mile on Belmont Stakes Day at Belmont Park as the next opportunity to get a Grade 1 victory on dirt, trainer Phil D’Amato said Thursday. Mohaymen is targeting the Westchester for his return; perhaps these two will meet in the Met Mile.